There is absolutely no doubt that #urolithiasis is a truly global disease. It is extremely rare in medicine to have a single disease entity with enough breadth and variety to generate such immense interest across the world that it merits a 3 days meeting on its own. 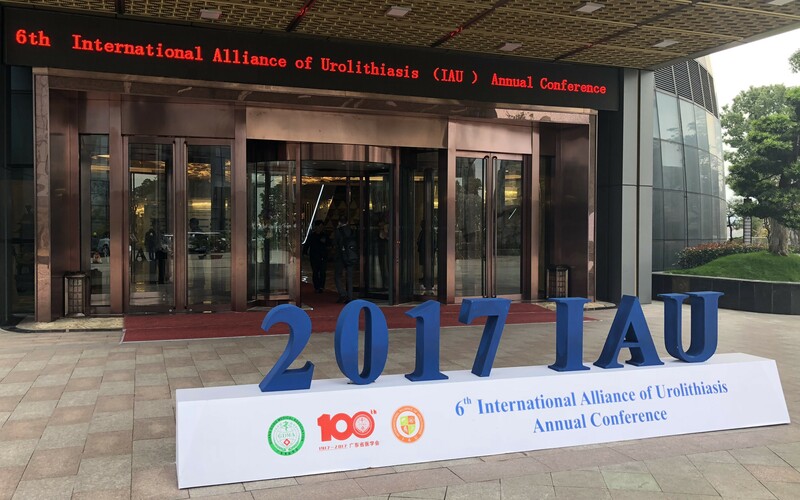 The International Alliance of Urolithiasis (IAU) was founded by Professor Zhangqun Ye, Professor Guohua Zeng (both from China), and Professor Kemal Sarica (Turkey, current chair of #EULIS) in 2010. The aim of the association is to provide a platform for urologists across the world to exchange knowledge on urinary tract stone disease, and to establish professional links for research. Famous for the fine yellow rice wine produced in the region, Shaoxing in Southeast China was chosen as the host city of this year’s 6th IAU annual conference. This was our first time attending the IAU, and we were both honoured to be invited to speak at the conference. We must congratulate the association and the organising committee in putting together a truly excellent program, which included many thought-stimulating and inspiring talks by eminent local and international stone experts, provocative debates, and many live surgeries demonstrating latest endoscopic techniques in the management of challenging stone diseases. #IAU17 started off with the Young Urologists sessions. These sessions not only provided an opportunity for young urologists from all over the world to present their work, but also set a stage for debates on controversial stone topics and a platform to interact with experienced and established eminent stone surgeons. 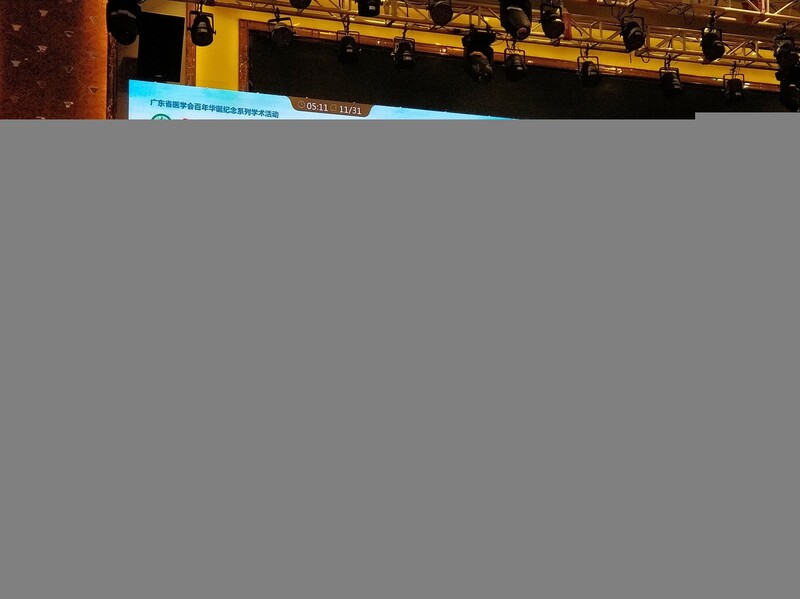 One of the first sessions were talks on #PCNL. All speakers agreed choice and accurate access is key to a successful and effective #PCNL. It is interesting to know that in China, the vast majority of punctures are performed by urologists. And with experience due to high prevalence of stone disease in particular in the southern part of the country, the practice of pure ultrasound-guided puncture has gained popularity in the past decade. 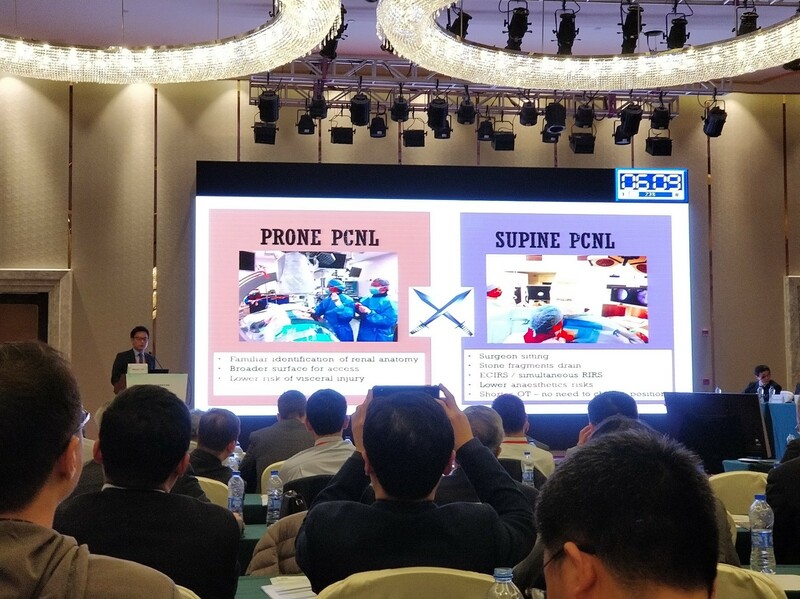 Dr Zhiyong Chen and Dr Xiao Yu, both from China, provided some tips and tricks on pure ultrasound-guided puncture for access for #PCNL, in particular when treating patients with complex or staghorn stones. Both sagittal and coronal planes should be used to assess all major and minor calyces, and they also interestingly showed that the benefit of aiming stones with multiple branches as the most effective first puncture point in patients with complex or staghorn stones. Position of #PCNL has been a regular debate in stone conferences, and few speakers in the young fellow sessions presented their findings and reviews on the topic. Both #supine and #prone positions have their pros and cons but all presenters agreed that surgeon’s preference to offer best chance of achieving best outcome is the most important determining factor. 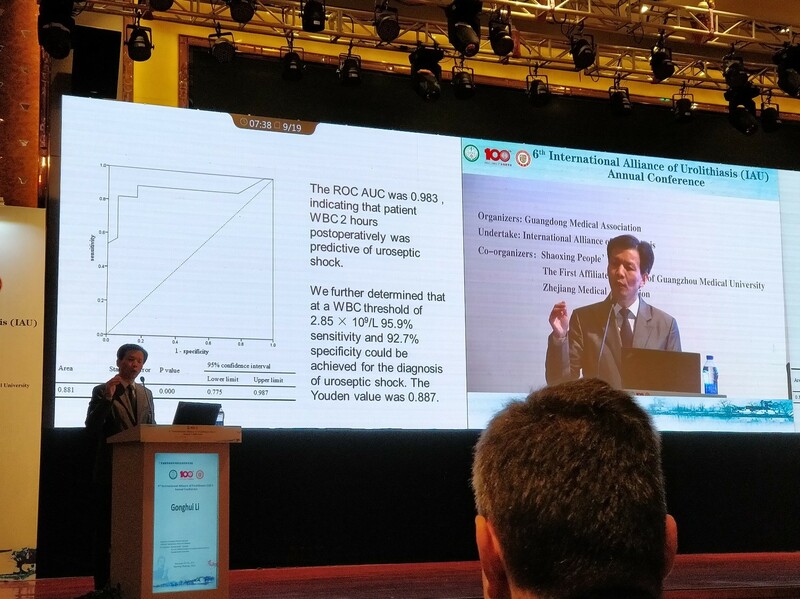 Another eye-catching presentation of the day was a randomised study conducted in China comparing standard #PCNL against mini-PCNL in the management of 2-4cm renal stone. The study randomised 800 patients and demonstrated that mini-PCNL was superior in terms of reduced bleeding, post-operative pain, shorter hospital length of stay, and more patients were ‘tubeless’ after the procedure. It is a well-designed study that will add much-needed high-quality data to the argument on #PCNL sizing. #Sepsis remains one of the most worrying complications during endoscopic surgery for urolithiasis. Optimal method of culture technique was discussed, with Dr Kremena Petkova of Bulgaria arguing that renal, pelvis, urine and stone cultures are more specific and sensitive in predicting post-op complications. Both are superior to #MSU, with higher concordance between pathogens and antibiotic sensitivities. However, their results are not often available pre-operatively, and it’s best to use them as guidance on choice of anti-bacterial treatment if sepsis develops post-operatively. However, in patients with high risk of post-operative sepsis despite peri-operative prophylaxis; renal, pelvis, urine and stone culture should be considered. 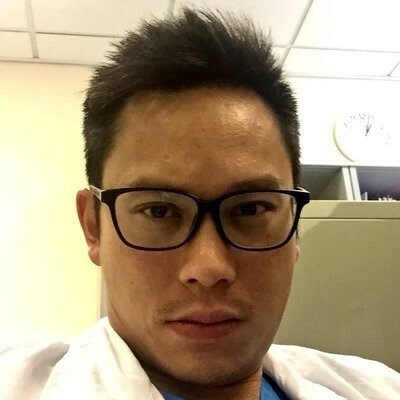 Another very interesting study was a randomised trial presented by Dr Wei Zhu from Guangzhou, China, on investigating dosage required for prophylactic antibiotics for patients undergoing retrograde intrarenal surgery for stones. Their study suggested that stone size is a determining factor of whether patients require prophylactic antibiotics, with risk of post-operative sepsis being low if <200 mm2. 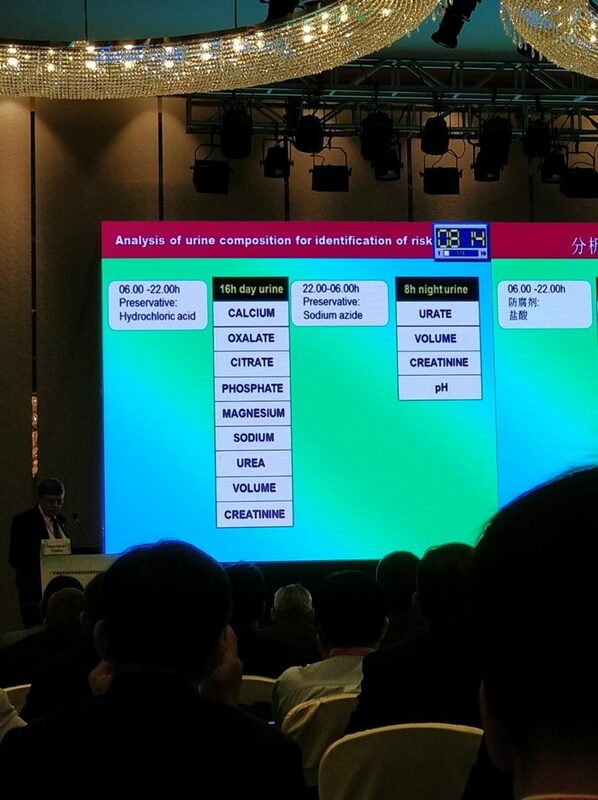 In the stone prevention session chaired by Professor Hans-Goran Tiselius from Sweden, Dr Guohao Li from China presented a study on reduction of urinary oxalate. Diet in general contributes to urinary oxalate concentration, and they discovered the use of a mushroom powder is able to reduce oxalate contents by degradation in traditionally oxalate-rich things such as spinach and tea. 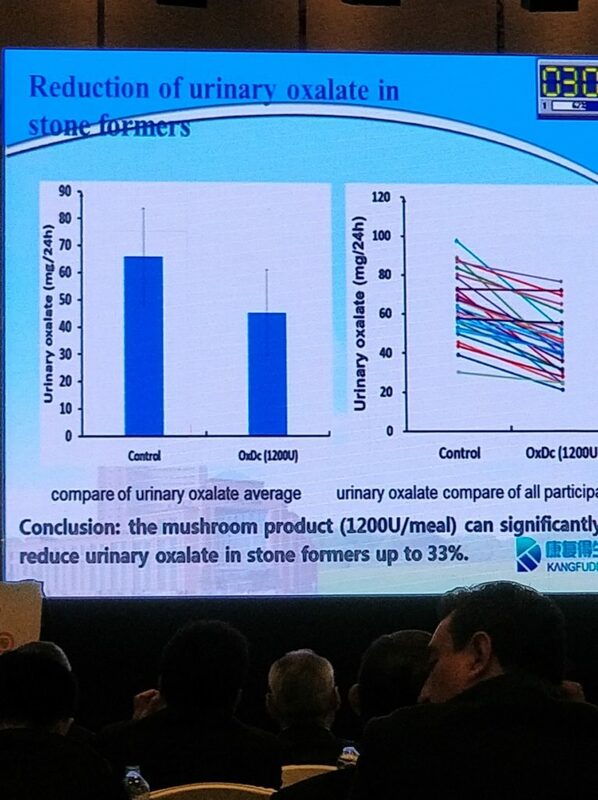 Their study found that the mushroom product is able to reduce urinary oxalate in stone-formers by up to 33%! 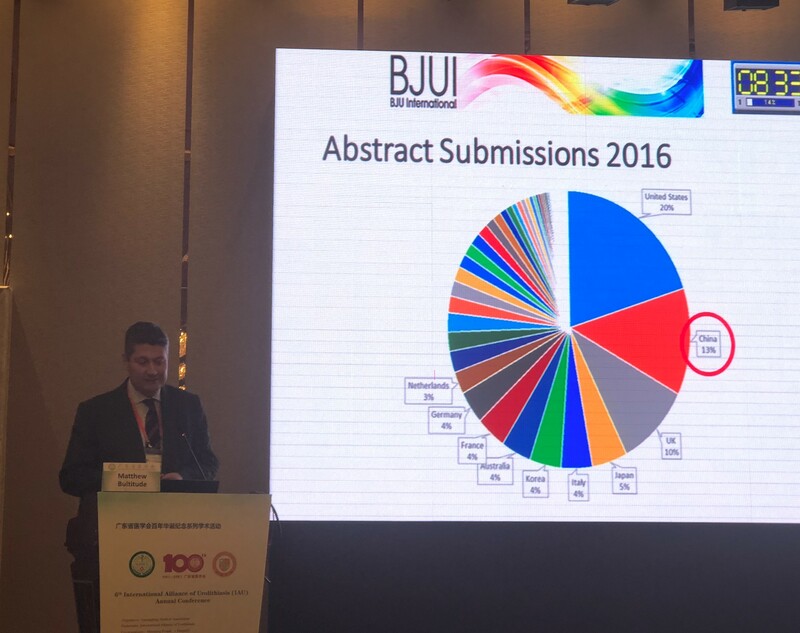 @Mattbultitude, representing @BJUinternational, was invited to give a talk on tips for submitting manuscripts to the journal to maximise the chances of publication. An interesting fact was that China submitted more papers to @BJUinternational in 2016 than the UK, and came second only to the USA. There are now services from the Journal’s publisher,Wiley, to help improve fluency of manuscripts for papers written by authors whose first language isn’t English, and perhaps this may further increase acceptance rates from countries such as China in the future (https://wileyeditingservices.com/en/translation-service/). Heavy weights in #urolithiasis closed the last session of the first day of #IAU17. Professor Pal from India, with over 30 years of experience in PCNL, offered tips to young urologists on a procedure not often talked about in textbooks. Short, straight puncture track through a papilla into the most peripheral calyx harbouring or leading to the stone is what we should be aiming for when performing the puncture, and he suggested that meticulous alignment of the C-arm is crucial to provide the spatial information to guide us to do that. This was followed by Professor Jean de la Rosette from the Netherlands, who gave a provocative but strong arguments on why he felt #MET should not be recommended. This discussion came as a heated debate has been going on with regards to the recent publication of a very large, multi-centre randomised controlled trial from China suggesting the use of MET is beneficial in patients with larger distal ureteric stones, and of course much debate was initiated after his talk amongst the audience and on social media (see The Drugs Don’t Work … Or Do They? https://www.bjuinternational.com/bjui-blog/drugs-dont-work/). As we all know, 24-hour urine work-up is dreaded by most recurrent stone-formers. It takes up a lot of the patient’s time and thus may result in incomplete collection or just simply be forgotten. Professor Hans-Göran Tiselius described an abbreviated form of the 24-hour urine work-up that he uses in order to reduce patient inconvenience when collecting the urine samples. The first 16 hours are used to collect most of the common urine biochemistry of calcium, oxalate, citrate, etc while the last 8 hours are used to measure for urate and pH. Each portion is then extrapolated to achieve the final data. Through three examples, Professor Tiselius shows how it is easy to apply the results from the 24-hour urine to give specific dietary instructions and treatment to the patients in the prevention of stones. One of the final talks of the day was presented by Professor Thomas Knoll from Germany on the use of miniaturised PCNL. Various high-quality comparative studies have demonstrated the benefit of miniaturised equipment for PCNL (in particular reduced morbidities), and interestingly the availability of miniaturised systems appeared to have increased the use of PCNL instead of using RIRS and ESWL for patients with renal stones. This final session, with master stone surgeons sharing their experience and knowledge in the Young Urology Section, allowed the up-and-coming urologists a chance to pick the mind of the masters. It set a great tone for the first day and created anticipation for the coming two days of the conference! Day 2 of the conference was full of exciting talks and live surgery, spanning over 12 hours from 07:50 in the morning to 20:00 in the evening! This year @BJUinternational became an Affiliated journal of the IAU. 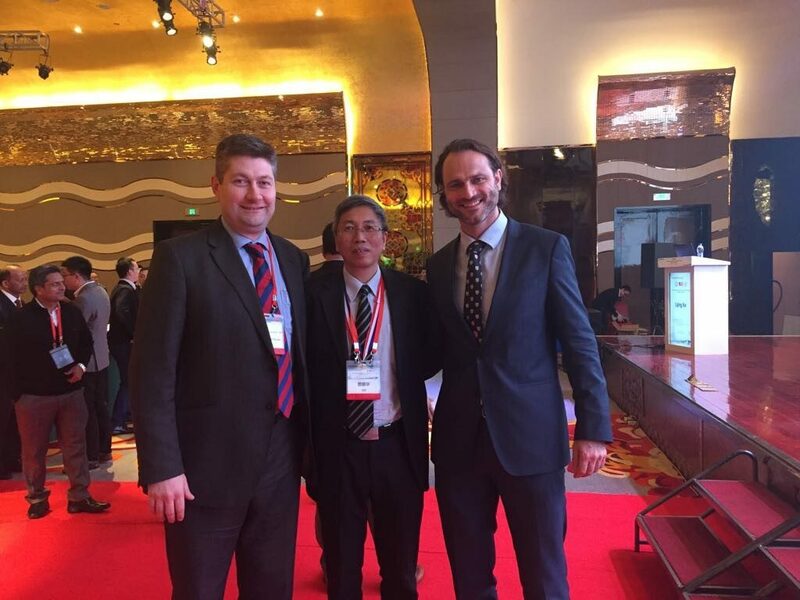 To celebrate this, a virtual issue comprising the 10 best stone papers published in the journal over the past 2 years was published online (Best of Urolithiasis VI), and @mattbultitude, Consultant Urologist and head of stone unit at @guysurology, was invited to present these selected papers in the meeting. Professor Alberto Trinchieri from Italy then provided an informative talk on the role of acid load in citrate excretion. Hypocitraturia is a common feature in up to 68% of calcium stone-formers. 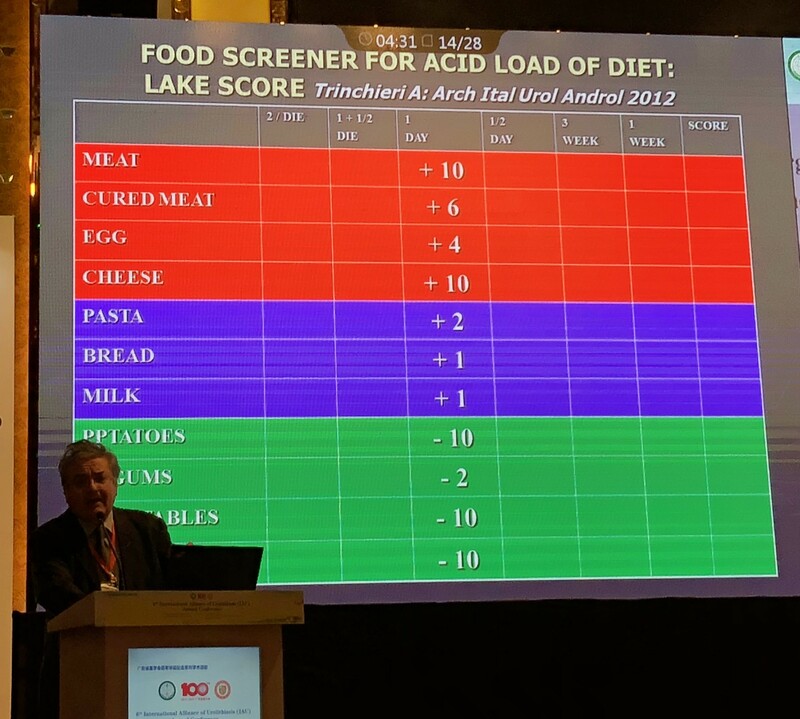 He argued that the acid load of the diet could decrease renal citrate excretion, and the LAKE score, could be a useful tool to be used as a food screener for acid load of diet. The LAKE score by Professor Trinchieri. He also argued that the use of oral alkaline citrate can potentially treat uric acid stones by dissolution and prevent calcium oxalate renal stones formation. Dr Ravi Kulkani from the UK gave an interesting talk on the management of stones in the elderly population. He presented a study conducted at his institution of 60 patients with a median age of 84.6 years with low morbidity, post-op ITU stay and a median length of stay of only 1 day for the cohort. Complete stone clearance rate was still high in the elderly population studied. It is important to assess co-morbidity pre-operatively and optimise them before any surgical treatment, together with extensive anaesthetic input and assessment. Patient selection is crucial and a good outcome can still be achieved in the ever-growing geriatric population. Following live surgery session demonstrating various tips and tricks of RIRS, the afternoon session on day 2 of #IAU continued to be comprehensive and informative. 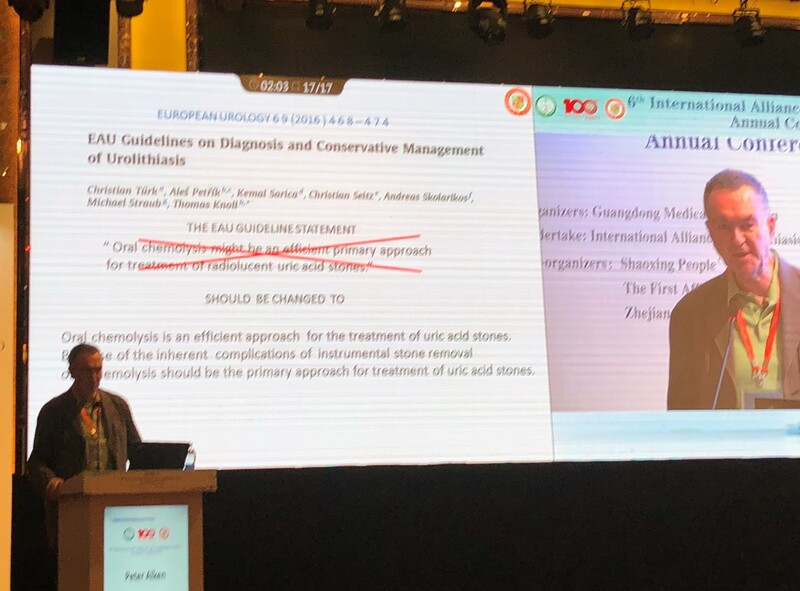 Professor Peter Alken from Germany gave a provocative talk on the underuse of chemolysis in treatment of patients with uric acid stones, of which most of the audience were in agreement. He argued that evidence suggests it is effective and should be recommended in the guidelines! Professor Peter Alken from Germany on chemolysis for treatment of uric acid stone. Another interesting study from Professor Gonghui Li revealed that post-endoscopic lithotripsy septic shock was heralded by a White Cell Count of <2.85 x 109/L at 2 hours post-operation, with sensitivity & specificity over 90%. Stepping up the antibiotics and aggressive fluid resuscitation at this point could stave off significant hypotension or even mortality in his study. Professor Gonghui Li of China on early detection of risk of septic shock post-surgery with White Cell Count at 2 hours post-op. In the evening, the conference became heated with various debates. Management of calyceal diverticulum stones has always been challenging. 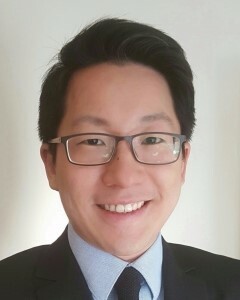 Mr Simon Choong from UCLH in London, UK, presented good arguments in the use of PCNL with high success rates, but Dr Yi Zhang also showed good clearance rate in experienced surgeons’ hands. And in selective cases, both minimally invasive and open surgery may have a role, presented by Dr Gang Zhu from China and Dr Zinelabidine Abouelfadel from Africa. Debate on optimal management of 1-2cm lower pole renal stone has been a hot topic for years. Brian Eisner (@BEendourology) from the USA argued that with experience, RIRS stone clearance rate is approaching that of PCNL but with lesser morbidity. However, seeing a live surgery of clearing a >3 cm stone with a miniaturised PCNL technique on day 3 of the meeting, with the patient left completely tubeless post-operatively, may have changed his mind! 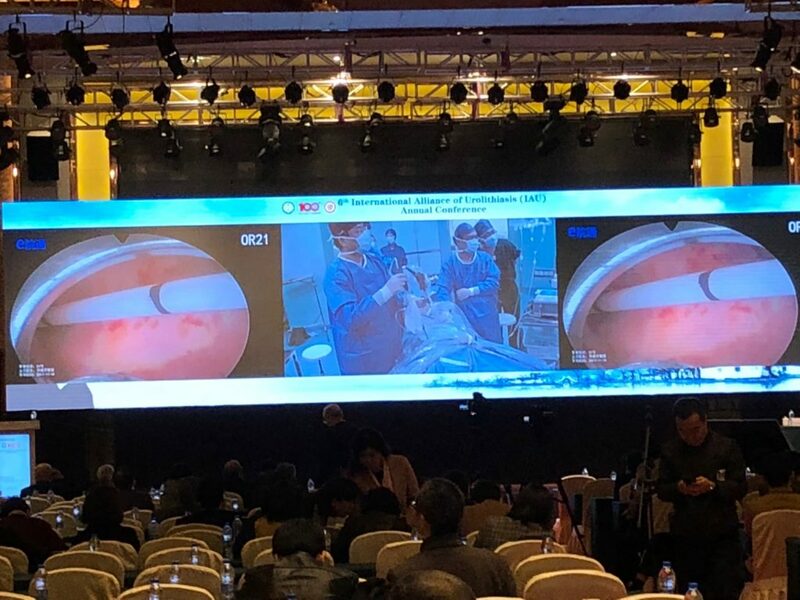 The final day of the conference included 13 live #PCNL surgeries, demonstrating various puncture techniques, tips on how to improve accuracy for access, and advanced surgical techniques including various miniaturised #PCNL by local and international experts. 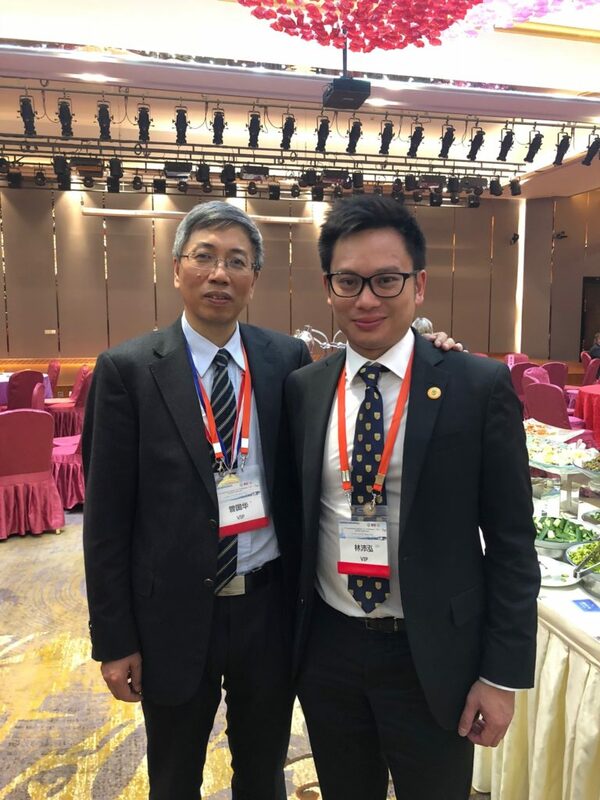 Professor Guohua Zeng from Guangzhou Medical University First Affiliated Hospital in China demonstrated the treatment of a 3.5cm lower pole renal stone using the second generation super-mini PCNL (SMP), which he invented. With its innovative sheath, which provides effective irrigation and controlled suction, he completed the surgery within 20 minutes. It was bloodless and tubeless, with visually complete stone clearance. Stones were completely extracted via its suction system for stone analysis. Professor Qu Chen of China demonstrated the use of ultra-mini-PCNL, effectively clearing a medium sized renal stone in a matter of minutes. 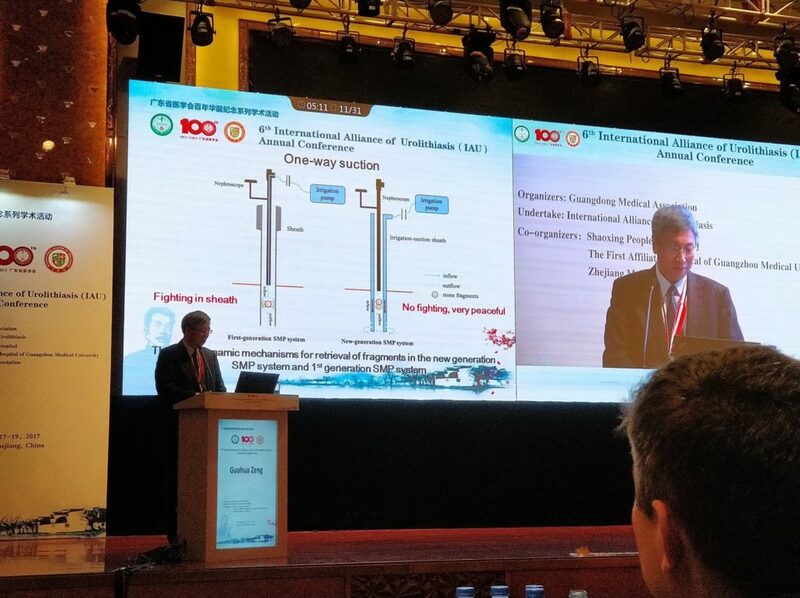 Interestingly, many surgeons in China prefers to use the ureteric catheter as inflow for irrigation, which generates a flow pressure to help flush stone fragments out – great tip! We must congratulate the #IAU17 organisers’ incredible effort in making the conference an inspiring and valuable learning experience to all who attended. The short duration (8-15mins) of presentations ensured that all the meaty details were packed in with very little fluff! It was also a great opportunity to build bridges to network and collaborate research in #urolithiasis. We thoroughly enjoyed it and would definitely recommend any urologist with an interest in #urolithiasis to attend its future meetings, and we very much look forward to #IAU18 in Istanbul! Great review Wayne and Brian. I thought this was an amazing meeting and I don't think I have ever been to a meeting quite like it. Essentially 2 whole days of just stones ! It was great to meet new people as well as catch up with old friends from around the world. Some great presentations and stunning live surgery. I was certainly convinced by the SMP demonstration for 3.5cm stone in <20 mins ... I just wish I had the volume to do 3000 PCNL's per year !! More than the whole of England and Wales! !